EROWA develops and manufactures workholding and automation equipment for the metalworking industries. The high-precision sectors of medical, aerospace, telecom and automotive manufacturing make use of the products to unlock the full potential of their CNC machines. The four main product ranges consist of workpiece holding, also called tooling systems, measuring and presetting equipment, automatic workpiece handling systems and process control software. Finely tuned to the needs of the customer’s respective application, this equipment will help to increase profitability and product quality. The first analysis on-site by our consultants is used to outline a possible introduction of new ways to manufacture parts. The central question is always the same: how can a customer’s productivity be increased, how will he arrive at a higher degree of competitiveness? Existing solutions and manufacturing techniques are analysed and approaches to improvement are suggested. A so-called ‘project day’ will see as many as possible of the affected parties sitting around the table in order to work out what specifically should be changed. In an ideal case, machine operators are involved as well, as it will be their job that is affected the most by any possible changes. The changes may be extensive, but sometimes a very simple thing is the best solution. The focus is always the same: finding the optimal solution for improving efficiency. The EROWA ITS Integrated Tooling System constitutes a standardised interface between workpieces and machine tools. Once all the machines are equipped with the same system, set-up times will be reduced drastically. The full productive potential of the machines is unleashed, as all time-consuming set-up and aligning work is done off-line and parallel to the production time. Custom fixturing by EROWA supports customers with the eternal question of ‘how should I fix this particular workpiece to my machine?’ Our engineers, all of whom have extensive practical experience, will propose solutions that are suited to the product in question. All aspects such as lot size, material to be machined, accuracy, repeatability, machines and technologies involved are considered and worked into practical fixturing solutions. This is about eliminating set-up times on machines. The ITS Integrated Tooling System enables operators to do all presetting outside the machines. Appropriate presetting stations serve to align palletised workpieces and, if necessary, determine offset data for subsequent transfer to the machines’ CNC control. Quality assurance is one of the key factors in the production sequence for medical components. The CMM Qi measuring machine will take care of all necessary measuring cycles and quality control reports. It may be integrated into an automated production line where the robot loads workpieces and the measuring cycle is carried out automatically. The CNC machines must do what they do best: produce. 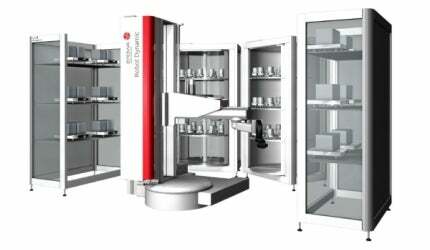 The EROWA robots increase the capacity of machine tools to an outstanding extent. By using the unattended night and weekend hours, the time to market of any product is reduced substantially. EROWA robots are always specially configured for the respective application. They may load from one up to eight CNC machines with work, and configuration is largely completed before delivery. The commissioning can be described briefly as unwrapping, positioning and connecting up. The variety of EROWA robots cover any part handling, from small and light to large and heavy for single or multiple machine loading. The main benefits of EROWA’s process control software consist of simpler working processes, eliminated sources of errors and increased flexibility for automated processes. With the help of the process control software, the automation of single unit batches is no problem. Large series can easily be divided up into small batches to be produced when required, substantially reducing the amount of floating capital. Just-in-time is no longer simply a technical term used by purchasing, but a realisable challenge for production. Many successful applications of EROWA FMC technology have been realised in the field of manufacturing for medical devices. Upon request, we will gladly supply you with case studies. Use the enquiry form or details below get in contact with us.